Staff at Fox Narrowboats are celebrating this week as they handover a cheque for £2157.64 to British Heart Foundation. The company chose British Heart Foundation as their charity of the year for fundraising in 2014. The British Heart Foundation is the nation’s heart charity and the largest independent funder of cardiovascular research. Coronary heart disease is the UK’s single biggest killer but we are leading the fight against it. 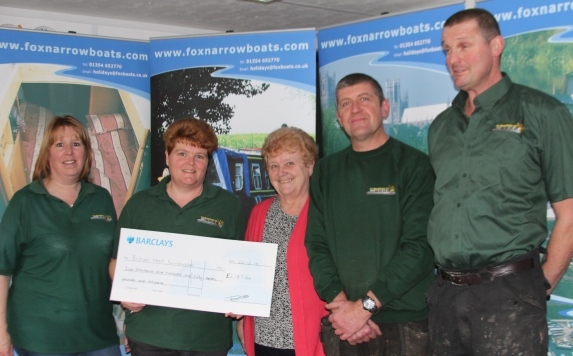 Fox Narrowboats staff raised the money from a variety of events including narrowboat trips at the St Georges Fayre in March, a tool sale, book stall, and a sponsored cycle ride around Rutland Water. They finished the year with Christmas tombola. East Anglian Children’s Hospice support families and care for children and young people with life-threatening conditions across Cambridgeshire, Essex, Norfolk and Suffolk. There care and support is tailored for the needs of all family members and delivered where the families wish – in their own home, at hospital, in the community or at one of three hospices in Ipswich, Milton and Quidenham.